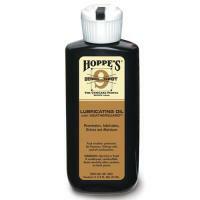 Hoppes BR1003 Bench Rest 9 Lubricating Oil with Weatherguard 2oz. Home > Hoppes > Gun Accessories > Gun Cleaning > BR1003 Bench Rest 9 Lubricating Oil with Weatherguard 2oz. BR1003 Bench Rest 9 Lubricating Oil with Weatherguard 2oz. A proven winner for all hunters and fishermen. Use before and after hunting and fishing trips to provide moisture and rust protection. Unlike conventional lubricating oil, Hoppe’s Bench Rest 9 Lubricating Oil with Weatherguard contains a moisture-fighting agent that drives moisture out while lubricating your firearm. ©2002-2019 CopsPlus.com: Hoppes BR1003 Bench Rest 9 Lubricating Oil with Weatherguard 2oz.